These brief notes are intended as a basic guide to the interpretation of decrepitation surveys. They are not a complete guide as this would require that the user be familiar with many aspects of heating stage microscope techniques and also have an understanding of the various types of fluid systems responsible for forming ore deposits. However, they should enable the user to begin to exploit the information recorded in fluid inclusions as an exploration tool. The number of peaks present. The temperatures at which these peaks occur. The magnitudes of the peaks. The widths of the peaks. For interpretation purposes the temperature of a decrepigram peak can be read at it's maximum or at it's toe, i.e. the base of the steep front slope of the peak. (This may have to be interpolated back to the baseline.) The temperature at the maximum has no real physical meaning and is used empirically in comparison between samples within a geologically meaningful suite. Despite its arbitrary nature, this temperature is the easiest to measure and usually the most useful in an interpretation. The temperature at the toe of the peak (the "onset temperature", meaning the onset of massive decrepitation) can, in some cases, be an accurate measure of the homogenization temperatures of the fluid inclusions and thus a guide to the actual mineral formation temperature. In other cases a correction of -70` to -20`C applied to the temperature at the peak of the decrepigram gives a reasonable approximation to the homogenisation temperature. In a study of quartz from the Kingsgate Mo-Bi mine in NSW, Hladky & Wilkins concluded that "the heating stage homogenization temperature data and decrepitation data for fluid inclusions are closely correlated". In addition they derived a simple correction procedure to estimate the approximate mean homogenization temperature from the mean decrepitation temperature. (They deduct about 75 from the temperature of the decrepitation peak.) These methods only apply to dominantly liquid phase inclusions with low CO2 contents. The reasons for this are well documented in the fluid inclusion literature and also explained here. Suffice it to say that unless you have associated petrographic data it is unwise to assume that a decrepitation temperature is actually the mineral formation temperature, but a reasonable estimate of the formation temperature can be deduced from the decrepitation data. The decrepitation data is best interpreted empirically by noting the temperature variations within a geologically and/or spatially related sample suite. The decrepitation temperature variations reflect changes in the fluid temperatures and compositions across the suite, although the absolute temperatures may not be meaningful. The results indicate the presence of anomalies in a suite of samples, the lack of absolute temperatures being of no consequence in an exploration situation using a properly selected suite of samples. Variations in the height (magnitude) of the decrepigram peaks are of less use in interpretation than are the temperature variations, as events which postdate quartz formation may erase some inclusions by annealing or grain boundary movement during recrystallization. But primary features such as the inclusion size distribution and initial abundances of fluid inclusions are also reflected in the sizes of the decrepitation peaks and may be important in the interpretation. Sample descriptions should note the degree of recrystallization (often giving a very granular texture to quartz) to assist in interpreting changes in the magnitudes of the decrepigram peaks. For quality control of the decrepitation results, a standard sample is analysed each day and compared with the archive of previous results. A very large quantity of crushed and sieved quartz from a proterozoic gold deposit near Darwin was prepared many years ago to use as this long term calibration standard. The sample was selected because it contains a modest level of CO2 rich fluid inclusions which decrepitate near 300 C. In addition unusual samples are occasionally analysed twice, and background blank levels are checked by re-analysing material which has already been analysed. Repeated analyses of the same sample show that the decrepigram reproducibility is one histogram interval (10`C) and 10% in amplitude of the peaks. Hence the minimum meaningful temperature difference is 10-20`C. If you are attempting to relate the decrepitation data with heating stage work it is of note that secondary inclusions don't seem to give a decrepitation response. It is suspected that the pressure levels of bursting secondary inclusions are too low to be detected, but the reason for this is not yet completely clear. The instrument automatically changes the plotting scale of the decrepigram to ensure it fits on the paper. The scale factors are binary multiples and the value used is printed on each decrepigram. Should you wish to rescale a decrepigram, the actual data is tabulated on each one just above the plot. Quartz is particularly well suited to decrepitation studies and is by far the most common type of sample used. It is resistant to weathering, brittle and often transparent enough to be amenable to concomitant microscope studies. As many as 3 distinct decrepitation peaks commonly occur in quartz samples. A low temperature peak (onset at 200`C or less, maximum at 200-300`C) is caused by the presence of CO2 rich fluids in the inclusions. This peak corresponds to the presence of a visible liquid CO2 phase in microscope work. The CO2 gives rise to rapidly rising pressures in the inclusions, resulting in decrepitation at relatively low temperatures. (In fact, often below the temperature of homogenization.) Shifts in the temperature of this peak probably relate to variations in the partial pressure of CO2 in the inclusions. (Don't confuse CO2 and carbonate. Carbonate accessory minerals in the system do not necessarily imply a high CO2 level in the fluids, and vice versa.) Note that this peak can be distinct even in samples with just 4 mole percent CO2 content. A medium temperature peak (onset 300-450`C, maximum 350-550`C) is a very common feature of quartz samples. It is not clear exactly what types of fluid inclusions cause this almost ubiquitous peak. This peak is the most useful when looking for temperature variations within a system. A high temperature peak (onset about 540`C, peak 570-580`C) is commonly, but not always present. This peak is indirectly related to the alpha - beta phase transition of quartz which occurs at 573`C. Note carefully that the transition does not give rise to a decrepigram peak on its own accord, but only in concert with fluid inclusion decrepitation. Just before this temperature the Young's modulus (mechanical strength) of quartz decreases , suddenly returning to normal above this temperature. This reduction in strength facilitates the decrepitation of any inclusions present, giving rise to this peak, which is always at the same temperature (almost - it can vary a bit), but of quite variable magnitude. Above this temperature, the renewed strength of the quartz positively inhibits further decrepitation and a pronounced temperature interval of low activity occurs. (If your samples show decrepitation above this temperature, then they weren't monomineralic quartz!) This peak is of limited usefulness in an interpretation and is probably caused by very small inclusions. Because little or no decrepitation occurs above this temperature, quartz samples are normally only heated up to 620`C. The interpretation procedures when using other minerals are gererally the same. Lacking the phase inversion at 573`C which occurs in quartz, most other minerals can be usefully heated to 800`C. (The maximum capability of the instrument.) Feldspars, carbonates, pyrite, magnetite and haematite are the most commonly used other minerals to date. Many sulphide minerals give distinctive peaks which may confuse the interpretation of samples in which they are present only as minor impurities. At higher temperatures they start to oxidize, which makes noise and gives rise to a decrepigram peak unrelated to fluid inclusions. Sulphides are generally only heated to about 600`C to avoid this problem. Carbonates give rise to very distinctive decrepigrams. These usually have a peak beginning about 300`C, with a maximum from 350-550`C and a tail up to 700`C or so. They almost always decrepitate violently (grains often fly 15 to 20 cms. away), giving a peak of great magnitude. 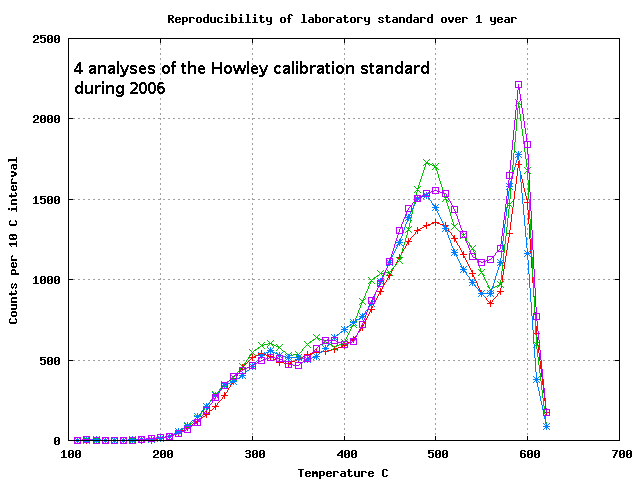 Most carbonates plot at scale factors of 32 or 64 and produce some 6000 counts in a 10`C temperature interval. The failure to show a pronounced decrease in decrepitation above 580`C assists in recognizing carbonate samples. If the dominant sampling phase is quartz, even small quantities of carbonate can swamp the quartz response and render the result uninterpretable. It is not exactly clear why carbonates decrepitate in this manner. Because carbonates are ductile, theoretically they should not decrepitate, or at best, the temperatures of decrepitation should be poorly related to their formation temperatures. However, carbonate samples do show significant differences between themselves, and these differences can be used in an interpretation of a suite of such samples. In some cases the carbonates decompose pyrolotically below 800`C and observation of this temperature may also be useful in an interpretation. Fluid composition - presence of CO2, degree of salinity. Host mineral strength and ductility. Despite the complexities involved in the theoretical understanding of the decrepitation process, case histories show that the data obtained can often make a significant contribution to an exploration program.